We no longer need studies to tell us: Smartphones are almost everywhere. Most of the customers coming through your doors have a mobile device with them. And these devices aren’t always shoved in pockets or bags — shoppers are using them while they’re in store too. So how can small and medium-sized retailers optimize for mobile? We’re talking more than simply making a mobile-responsive website — we’re talking about getting mobile users into your physical retail store and making them spend more money. Optimize your local business listings so it’s easy for mobile users to find you. While optimizing for mobile means engaging in-store shoppers on their devices, it also means finding potential customers outside of your store. Moz reports that there are about seven billion unique local searches on Google every month, and almost 60% of searches happen on mobile devices, according to Hitwise. Remember to always include your location, store hours, contact information and photos of the interior and exterior of your store. This will make it more appealing for shoppers to pay you a visit, and easier for them to find you when they do. 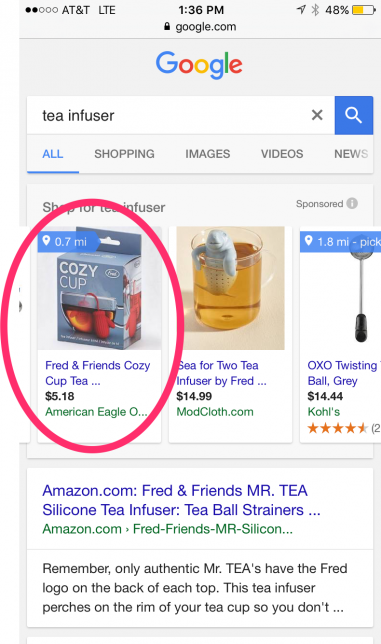 If you have an advertising budget, consider investing in Google’s local inventory ads (LIA). LIA lets you list your local inventory information online, so they show up as ads whenever shoppers search for products that you’re selling. Retailers should always be on the lookout for ways to improve the checkout experience. And one of those ways ties in perfectly with our theme of mobile optimization: mobile pay. Business Insider predicts a 20% compound annual growth rate (CAGR) for mobile pay through 2020. And the MasterCard Digital Payments Study found that mobile wallets were cited in three-quarters of social media conversations about new ways to pay. Many of today’s point-of-sale (POS) systems can accommodate mobile pay. You can integrate existing mobile checkout methods, like Google Pay, Apple Pay and even Venmo. Some retailers have also created their own mobile apps to allow customers to pay for orders from their phones. The U.K.’s Harris + Hoole, a chain of coffee shops, drove 20% of orders with the launch of their mobile app. Customers could place and pay for in-store purchases on their phone. WiFi marketing is when retailers and other businesses provide free wireless internet access to shoppers in exchange for some information, like an email opt-in or social engagement. This is good for customers because they have access to free internet, and it benefits retailers through audience-building and data collection. WiFi marketing is much more popular among consumers than you might think: 96% of them prefer to shop at and return to stores that offer free WiFi, according to Cisco. And almost 60% of shoppers demand in-store WiFi, per Oracle. In Perth, Australia, Waterford Plaza (a shopping mall) embarked on a project to provide free WiFi to all shoppers. They were able to increase data collection and customer profiles by 450%, learning that the average shopper would spend $0.75 for every minute spent at the mall. They were able to use these insights to implement personalization and increase dwell time. While augmented reality (AR) and virtual reality (VR) may still sound pie-in-the-sky to you (nearly two-thirds of companies don’t use AR at all, per Tech Pro Research), consumers are expecting retailers to step up to the plate and implement these technologies into the brand experience. Almost 70% of consumers expect retailers to launch an AR app within the next six months, according to DigitalBridge. AR and VR offer ways to connect with your mobile-savvy shoppers and enhance the in-store experience. Plus, it could mean that you can charge more for your merchandise: 40% of consumers would willingly pay higher prices if they can experience products through AR, reports Retail Perceptions. 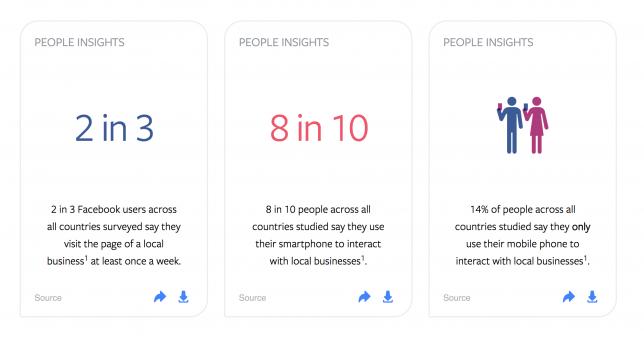 More than 1.6 billion people are connected to a small business on Facebook. About 66% of connected Facebook users visit a local business or event page at least weekly. 80% of consumers use mobile devices to connect with local businesses, and 45% use them to learn more about a business. Two-thirds of shoppers use mobile devices to find out about and engage with local events. Shoppers who use mobile phones as their primary device are 1.37 times more likely to find out about pop-up shops and local events on Facebook. Nearly half of businesses have started to optimizing marketing for mobile, and 40% believe this will continue to be important in the future. If you’re hosting an event, create a Facebook event page and use a geo-targeted paid ad campaign to drive interest. Make sure your profiles are optimized to share more information about your business. Add your retail store location to your Facebook page. If you have more than one store, use Facebook Locations to manage and promote all of them. Proximity marketing is an in-store tactic that uses beacons and other Bluetooth-enabled devices to connect to and engage with customers’ on compatible mobile phones. It’s technology that’s been around for a fair amount of time, and it’s continuing to grow. It was estimated to be worth more than $170 million in 2016 with a compound annual growth rate of more than 80% through 2024, according to a Global Market Insights report. Use beacons to send promotions to customers while they’re in your store, share important updates or even incorporate gamification to make the shopping experience more memorable. One way to enter the mobile arena and gain access to built-in support is by partnering with a mobile app provider. Coupons, customer loyalty programs and online ordering are just a few features to consider that can help you capture mobile customers. For example, RetailMeNot has a great mobile app that lets consumers easily find coupons. If you’re running an offer, you can tap into those mobile users (as well as those browsing online) by submitting your coupons or partnering with the RetailMeNot team. There’s also a huge market when it comes to mobile ordering. If you’re looking to let your customers place orders using their smartphone, you can team up with apps such as Postmates, Curbside, and the like. That’s what Grain & Vine, a boutique wine and spirits store does to drive more sales. 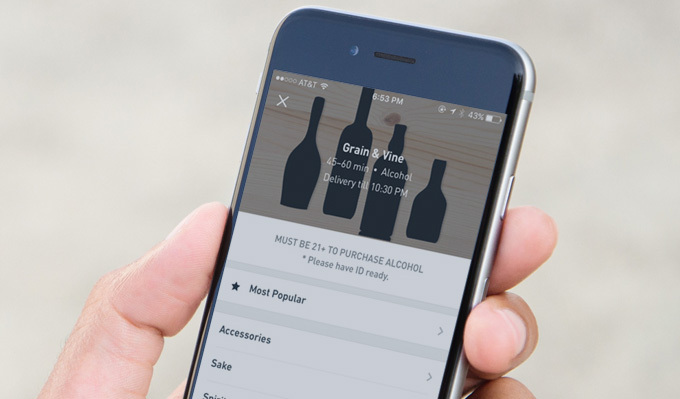 In addition to selling in-store and online, Grain & Vine also offers same-day delivery through apps such as Postmates, Minibar, and Drizly. They do this by tightly integrating their POS system (Vend), payments processor (Square), ecommerce store (Shopify), and mobile ordering services, so data flows smoothly from one platform to the next. In other words, their systems can “talk” to each other and share data in real-time, so when orders come in, Grain & Vine’s inventory is synced across its physical and digital stores. As for the different delivery applications, Grain & Vine owner Michael Nagdimunov says they use an XML file to sync their inventory with the apps. If you’re going to implement multi-channel ordering, take a leaf out of Grain & Vine’s playbook, and choose platforms with tight integrations. To make things easier, go for solutions with existing integrations, so you won’t have to develop one yourself. Going mobile isn’t just about marketing and customer engagement. Part of having a winning mobile strategy is arming yourself and your team with the technology that can save time, maximize productivity, and enhance the customer experience. Point of sale – Would your business benefit from a mobile point of sale solution? Mobile POS systems are particularly helpful if you limited space in your shop. They’re highly portable and enable you to serve customers from anywhere in the store. mPOS solutions during peak hours when you’re dealing with long lines and need to either quickly open new registers or have associates ring up sales while shoppers are still in line. Retail management – Having a mobile-friendly retail management system will allow you to check — or even run — your store from anywhere. Imagine being able to view real-time sales, check stock levels, and place orders right from your device. Having such capabilities means you don’t have to be in your shop to know what’s going in your business — which is a godsend especially if you’re constantly on the go or are running multiple stores. If you enjoyed this post, be sure to check out Vend’s guide to increasing sales. 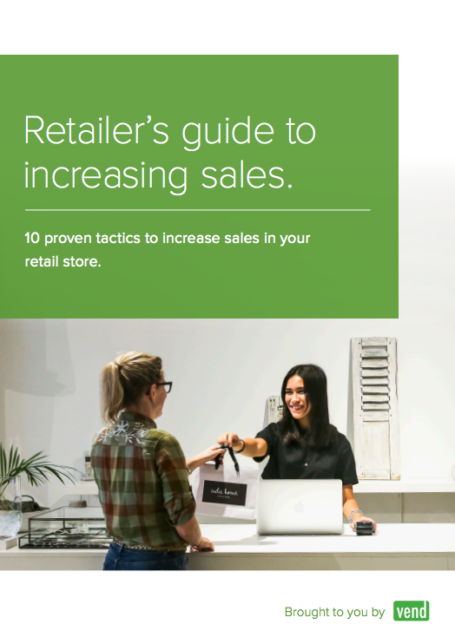 This handy resource offers 10 proven tactics for boosting retail sales and improving your bottom line. © Kidmans Partners Liability limited by a scheme approved under Professional Standards Legislation.